In HELIOS we strive for continuous improvement to meet the expectations of our customers and broader environment. Our common beliefs and main principles are gathered in HELIOS Core Values. HELIOS Core Values form the foundations of our actions and commit us to the behaviour that leads to excellence across all business processes. Values guide our relations with each other, the environment and business partners. We have a strong commitment to the environment, employees’ health and safety. We are enthusiastic at our work and strengthening the awareness of taking responsibility along the entire value chain. We constantly improve our knowledge and care for professional and personal development. Through lifelong learning we raise the added value of employees, the company and our business partners. With reliability, respectful behaviour and following the ethical principles, we maintain integrity also in the most demanding situations. With prompt and thoughtful decisions, we effectively deal with the changes and needs in the market and provide quality solutions. To achieve goals, we choose the most optimal way to get excellent results in the short term. With a constant focus on understanding and exceeding the needs and expectations of our business partners, we are building genuine relationships. With innovation and a creative approach, we respond to changes quickly, and we are acting towards continuous improvement and positive effects. HELIOS commitment to fundamental standards that ensure good workplace conditions and transparent business relations is outlined in the Code of Conduct. 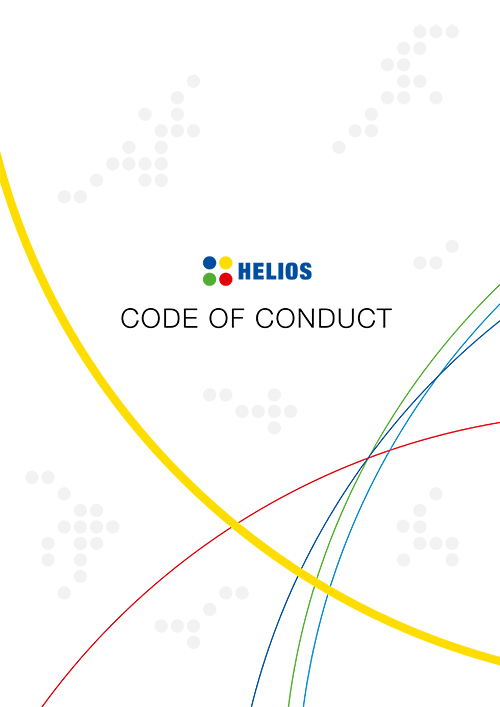 This Code of Conduct is binding for all employees of HELIOS worldwide. All our managers and employees have a personal responsibility to be aware of the Code of Conduct and to comply with it. Knowing, understanding, and living the Code, is an essential part of who we are, and what we stand for in HELIOS. Our Code defines how we understand our responsibilities, presents our commitments to the environment, health and safety and the desired culture of communication. It offers us guidance for avoiding conflicts of interest and relations with colleagues, partners and other stakeholders.